(d) if so, the main issues of discontentment and Government’s reaction thereto? 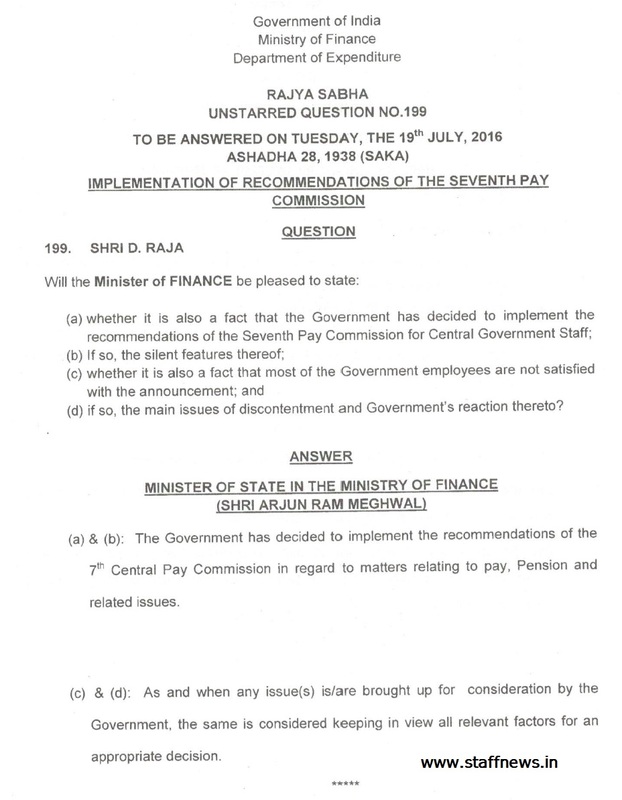 (a) & (b): The Government has decided to implement the recommendations of the 7th Central Pay Commission in regard to matters relating to pay, pension and related issues. (c) & (d): As and when any issue(s) is/are brought up for consideration by the Government, the same is considered keeping in view all relevant factors for an appropriate decision. The NJCA should attempt to educate it's members about implications of the 7th CPS'S recommendations relating to PAY RISE. ALLOWANCES ARE SECONDARY. 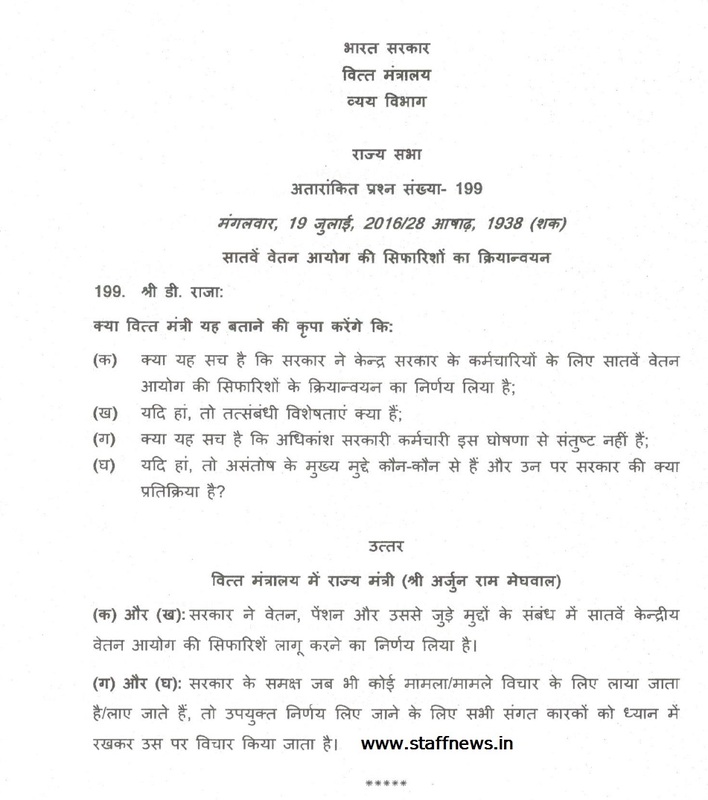 I UNDERSTAND THA, WITHOUT IMPLEMENTATION, THE MINIMUM SALARY, INCLUDING DA, WOULD HAVE BEEN HARDLY ABOUT RS 200 PER MONTH. IF, THE DA HAD BEEN MERGED AS RECOMMENDED BY THE 6TH CPC, THE RISE WOULD HAVE BEEN EVEN LESS! 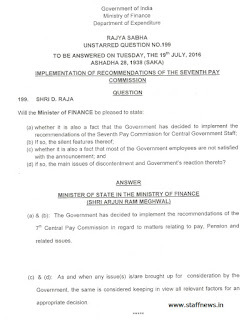 SO, WHAT IS THE REALISTIC BURDON ON THE GOVERNMENT on account of pay rise ONCE THE NEW PAY STRUCTURE IS ALLOWED? If the Government has overestimated the expenditure, it should be brought to the notice of people. Factor in the increase in IT and Pension contribution, what is left in the employees' pockets? Once this issue is clarified, The Government's bluff can be nailed. Probably the union's and associations were not sure about success of the proposed strike....and had to postpone the same. 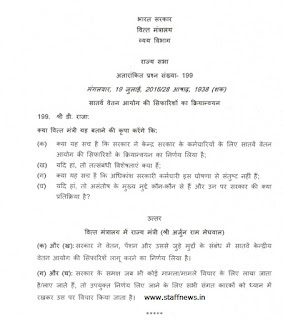 (c) whether it is also a fact that most of the Government employees are not satisfied with the announcement; and (d) if so, the main issues of discontentment and Government’s reaction thereto?